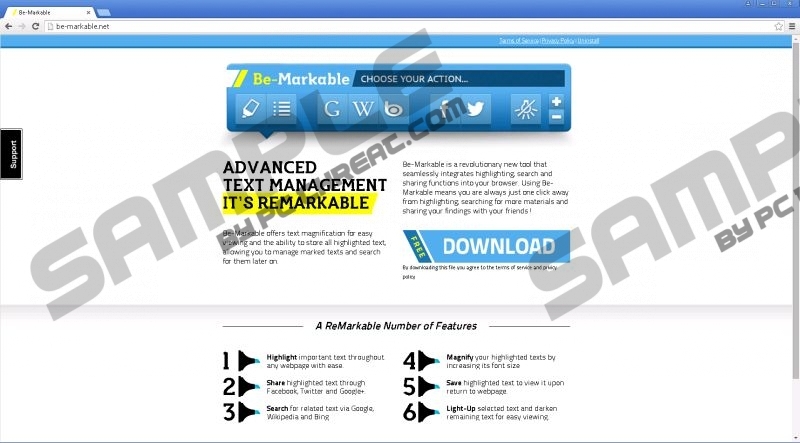 Be-Markable is a program that offers you to highlight any important text you find online. Afterward, you will be able to share the text on social networks or light-up it to view it more easily. However, the program will hardly fulfill any of promises it makes. Instead, it will surely attack you with annoying commercial advertisements. Those ads are very irritating, and they can even be potentially dangerous to click on. The program is an adware application that comes from the infamous Lyrics family. We think that all members of this family should be removed from a computer and Be-Markable should be no exception. We have recently turned our focus onto some other Lyrics applications, such as PasswordView and Ideal Deal. They promise various features, and some of those may even look appealing. However, you should know that most of the time, such applications do not act in the way they should. They were created for completely different goals. All they are capable of is bombarding your screen with numerous ads in the form of banners, pop-ups, shopping offers, and comparisons. We need to tell you more about those advertisements and why we recommend that you do not click on any of them. Those ads contain redirect links to unknown websites that are controlled by various third parties. Most of the time you will just increase traffic to useless pages by clicking on any of ad that Be-Markable generates. But sometimes you can be transferred to very unreliable pages that may be the source for malware distribution. In the worst case scenario, you will have to fight all the infections yourself, as Be-Markable is not liable for any negative consequences that may occur if you click on any of the ads. There is another thing that unites Lyrics adware applications. It is almost impossible to download them from their official websites. In the case of Be-Markable, the official website located at be-markable.net does not work at all because the domain name expired on 24 September. We can only guess that creators of this adware application have lost their faith in this product. However, it still may come to the computers of unaware Internet users. Similar programs are usually distributed in packages with other legitimate and not so much free applications. If you recently downloaded any program from free software websites, then this may be how you have opened a door for Be-Markable into your system. Please be aware that not only advertisement-supported applications are distributed in software bundles. Developers of malicious programs also use bundling method to spread their products widely. You should be as careful as you can if you have a habit to of downloading free programs from the Web. Pay your utmost priority to the Terms & Conditions of every program you install. Only then you will be able decline all the additional offers and protect your system. However, it is not beyond possible that some unwanted application has already sneaked on your computer along with Be-Markable. You will have to remove it, but for now, start with the elimination of the latter adware application. You can do it manually, and we have prepared a short guide that will explain how to get rid of the intrusive program. After you are done with Be-Markable, consider acquiring a trustworthy and legitimate antimalware scanner. The reliable security tool will detect all the suspiciously-looking applications on your hard drive and eliminate them one by one. Please post your message on our account on Twitter, Facebook, or Google+ in case you want to ask us about the adware program, its elimination, or the defensive program we recommend that you use. Launch Control Panel and open Add or Remove Programs. Click the Windows logo and access Control Panel. Choose Programs and Features and uninstall the unwanted program. Quick & tested solution for Be-Markable removal.